Frederick Penny’s date and place of birth have not been determined but it is possible he was born in 1843, son of Henry and Phillis Penny. In 1872 at Sydney, he married Frances the daughter of John and Frances Doyle and they had one son William F, born in 1873. Frances died in 1877 and in 1878 he married Jane Woods. He died in 1907, having spent 64 years in Sydney. Frederick Penny was working as a butcher’s mate on the Duncan Dunbar when it was wrecked off the South American coast in October 1865. A fellow survivor was former Sydney Mayor George Thornton. By 1873, Frederick Penny was married and established in Sydney with a butcher’s shop at 80 Dowling Street. 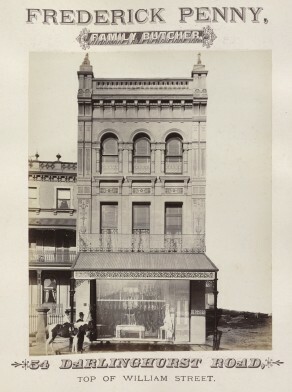 In 1880, he had expanded his butchery and moved to 54 Darlinghurst Road at the top of William Street. From 1889 to 1905 he was at 88 Darlinghurst Road. He was a Justice of the Peace. Frederick Penny was elected Alderman of Sydney Council for Fitzroy Ward, 1 December 1894 to 6 December 1900. Penny was a member of the Finance Committee in 1900.